I have been reflecting on all the aspects of my brother Ronnie’s passing in September and I thought about you and Aria. 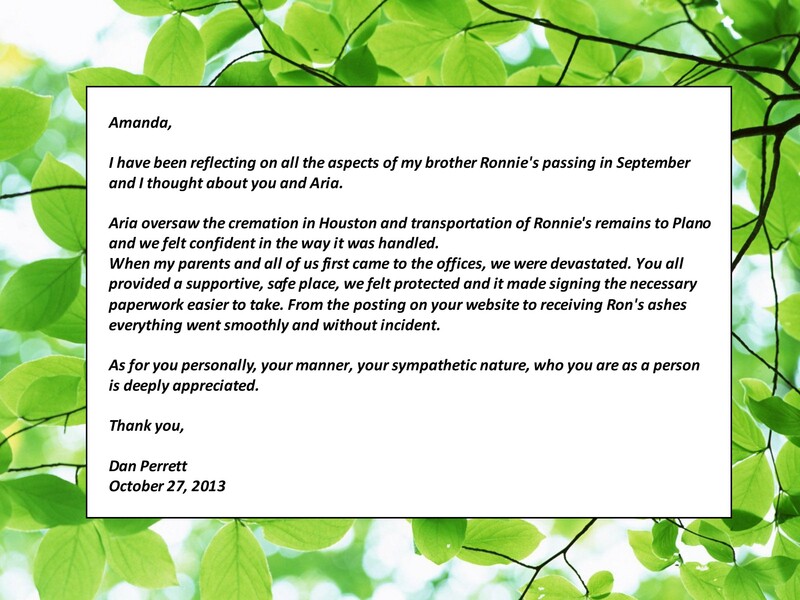 Aria oversaw the cremation in Houston and transportation of Ronnie’s remains to Plano and we felt confident in the way it was handled. When my parents and all of us first came to the offices, we were devastated. You all provided a supportive, safe place, we felt protected and it made signing the necessary paperwork easier to take. 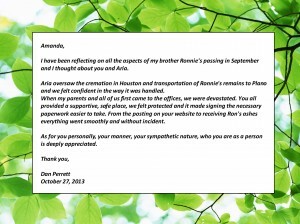 From the posting on your website to receiving Ron’s ashes everything went smoothly and without incident. As for you personally, your manner, your sympathetic nature, who you are as a person is deeply appreciated.